In their first serial effort, newcomers Republic Pictures went with the tried and true: beloved animal trainer Clyde Beatty, who had earlier headlined the Mascot serial The Lost Jungle (1934). It is really Beatty, playing himself, who meets and saves Baru (Manuel King), "The Son of the Jungle," and his sister, Valerie, Goddess of Joba (Elaine Shepard). The latter is held captive by an evil High Priest (Lucien Prival), who has aligned himself with a couple of nasty white traders and a force of winged bat-men. In the 15th and final chapter, "The Prophecy of Gorn," the jungle city of Joba -- High Priest, evil traders, ferocious bat-men and all -- is swallowed up by a gigantic stock footage earthquake. Nat Levine, who had merged his serial empire, Mascot Pictures, into the new Republic, produced with his usual keen sense of economy, and the serial was co-directed by the veteran B. Reeves Eason and former film editor Joseph Kane. 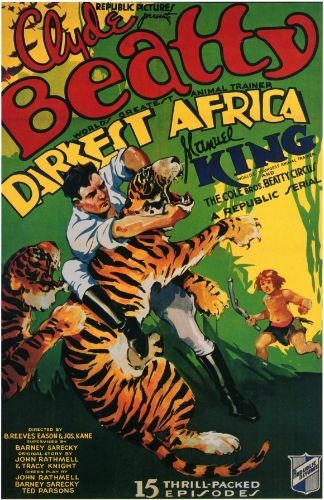 Darkest Africa was also released in an edited feature version, Batmen of Africa, and re-issued in 1949 under the new rather cumbersome title King of the Jungleland. The proud owner of a gorilla suit that would see jungle-film duty well into the television era, Ray "Crash" Corrigan appeared both in and out of his suit in this serial, billed, rather modestly, as "Ray Benard." 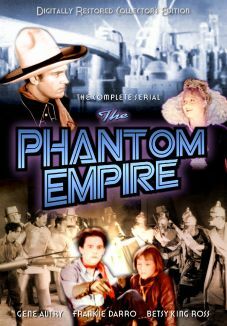 Corrigan was to star in Republic's second serial, Undersea Kingdom (1936). Manuel King, Beatty's young and rather pudgy sidekick, was actually somewhat of a rival who billed himself, probably with some accuracy, as "The World's Youngest Wild Animal Trainer."